We BLOOP dig BeeJive on the iPhone. What we BLOOP don’t dig is getting a pop-up push BLOOP notification every 3 seconds just because some of our friends like to type in fragments rather BLOOP than sentences. Fortunately, BeeJive has recently added a new setting which lets you tweak the behavior of push notifications to be far, far less annoying. The wording they chose to tuck it behind doesn’t make things completely obvious, but it makes a world of difference. 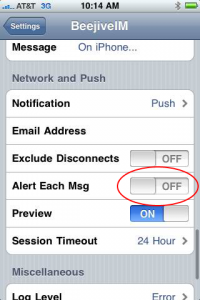 With this setting, you’ll only receive one pop-up notification for each sender. For example: If Joe sends you a message and you don’t check it, you’ll see a pop-up alert. If he sends you 10 more messages, you won’t see 10 more pop-ups – but you will hear the alert sounds. If another friend comes up and sends you a message, however, you’ll get a pop-up alert. You still get pop-up alerts, you just don’t get hammered to death whenever someone sends you a string of IMs when you’re just trying to play some damn Tower Defense. While you’re in there, you ought to set Session Timeout up to something higher than the default of 1 hour as well.